There are humans who can change things for the better. One of the people interviewed in Project Wild Thing is writer Jay Griffiths. She spoke such good sense about children needing to be in touch with nature I sought out her books. The first I’m reading is Wild and it’s fantastic. The language is dense and lush. It’s a jungle of a book; a tramp through fecund vocabulary, an evocative trip into the wilderness of an awesome intellect. She’s our guide to wilderness and our perception of it; she’s a kind of literary David Attenborough. I have not been so excited about an author scince I stumbled upon Under the Sea Wind by Rachel Carson. Jay Griffiths is another learned, poetic writer exploring the world, seemingly without fear, creating an incredible reading experience for those of us in our armchairs. She delights in language and her lucid explanations of etymology of words in different languages underpins much of the book. She begins in Peru, seeking healing with the drug ayahuasca. (Slight detour here by way of a rambling podast – Simon Amstell chats to Marc Maron about his ayahuasca experience.) Jay Griffiths is the sort of person who will get up from the depths of depression, go to Peru with a total stranger and then wander around the Amazon continually drinking a hallucinatory drug untill she gets it right – realises she’s a jaguar – and then heads of to the next section of the book – an obvious flight into remote Canada to hang out with the Inuits. Wild? Certainly. 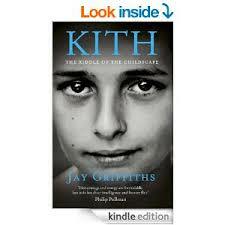 I’m still exploring her Wild mind and journey as well as looking forward immensely to reading Kith. Here’s an excerpt on her website first published in the Guardian. She speaks of the horror of controlled crying and the political necessity for it in modern ‘civilisation’ and the need for children to have their own time. In 2011, Unicef asked children what they needed to be happy, and the top three things were time (particularly with families), friendships and, tellingly, “outdoors”. Studies show that when children are allowed unstructured play in nature, their sense of freedom, independence and inner strength all thrive, and children surrounded by nature are not only less stressed but also bounce back from stressful events more readily. This all makes such sense to me, particularly because my own child was schooled in an alternative environment at Preshil which, theoretically at least, allowed children freedom to explore their own choices, to develop their own minds and unleash their imaginations. My child was left alone to get on with his own business and although he’s had his fair share of teenage angst I believe he’s resilent and capable, living in another country at eighteen and learning what he needs to know to grow up and get on with the job of living. Much of Jay Griffiths’s thinking resonates deeply and personally with me. Seek her out, check out her videos and learn from her immediately!